A combination of brains, beauty, and an incredible amount of heart make the Border Collie a wonderful companion/working dog. 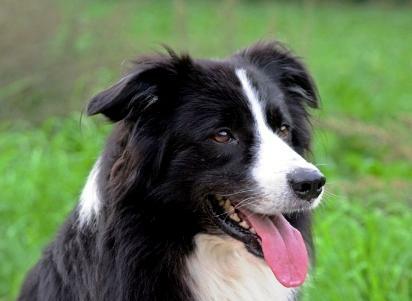 The Border Collie was developed along the borderlands between England and Scotland, giving this breed its simple no-frills name. Needing to earn their keep, these dogs were selectively bred to become one of the finest, if not the outright best, herding breeds of all time. They are incredibly dedicated to their flock and will go to nearly any lengths to protect them. Highly energetic, Border Collies are well-balanced dogs that should carry good muscle tone without excess fat. The breed is celebrated for its agility, a necessity for herding sheep, so being in top condition is a must. This is a medium-sized breed and individuals should be slightly longer than they are tall. The breed has a weather-resistant double coat that may be either rough or smooth in variety. All coat colors and markings are permissible. Intelligent, intense, energetic, and fun are all words used to describe the Border Collie's personality. These dogs are generally up for any activity you have in mind, but they are also quite capable of spending time lying quietly at your feet. Perhaps the most notable feature of these remarkable animals is their eyes. Border Collies don't miss a thing going on around them and every move is marked with intense scrutiny. This produces the patented Border Collie stare occurring when they focus their full attention on any object or task at hand. While observing them in action, you see their mind's wheels turning as they process information and decide whether any action is required. The Border Collie was bred for its purpose as a working dog, thus producing a great ability to reason. This same quality easily lends the breed to training in a variety of other areas. Natural herders, Border Collies are at their best when allowed to live and work in a pastoral setting. Shepherding trials provide an excellent outlet for their natural instincts. Today, these dogs are perhaps better known by the general public for their excellence in dog sports such as agility, flyball, and obedience. Wherever competitions are held, chances are a Border Collie will enjoy top honors at the end of the day. Their keen intelligence also makes Border Collies good candidates for service companions for the disabled, and they are increasingly trained as hearing dogs, seeing eye dogs, and therapy dogs. 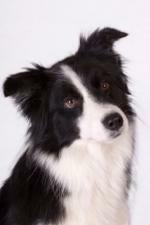 Nearly all breeds have a few health concerns to contend with and the Border Collie is no exception. However, conscientious breeders are working to remove affected animals from their breeding programs. Border Collies are magnificent animals, but there are a few points to consider if you're thinking of taking one on. The extremely intelligent nature of these dogs needs to be channeled to keep them from getting into mischief, which will happen without enough guidance from you. Collies also need a good deal of exercise to burn off excess energy. So, unless you lead an active lifestyle yourself, you might not be able to provide the kind of activity these dogs need to stay in top condition. It takes a dedicated owner to provide a Border Collie with the kind of life that balances their natural talents and instincts with life as a family pet. Although, when the balance is found, these dogs can be amazing canine companions.